Not every dog thinks that a round of fetch is doggie nirvana. Some would rather track interesting smells, or learn new tricks. Some would rather dig a hole to China. And some, of course, just want to see what’s next on Animal Planet. Dog like to play differently, depending on their breed and their individual personality. But once you figure out which games wag your dog’s tail, you can use them to give him exercise, mental stimulation, and a sense of purpose. (Yes, even dogs like to feel useful.) Then there’s the bonding that comes from having so much fun together. After all, that’s the best part of sharing your life with a dog. Once you’ve checked out our games, please share your own ideas at the bottom of the page with the owners of other Jocks, Diggity Dogs, Couch Potatoes, Ball Hounds, Noses, and Smart Cookies. Recognize your dog here? Find out how he really wants to spend his play time. Dogs can’t sweat to cool off. So in hot weather avoid heavy exercise, give your dog plenty of water, and be alert to signs of heat stress, such as glassy eyes and heavy panting. Short-nosed breeds, like Pugs and Bulldogs, are especially vulnerable to overheating. Build up your dog’s exercise routine gradually. Playing weekend warrior can result in torn ligaments and other injuries (for both of you, in fact). High-impact exercise can damage a young dog’s growing body. 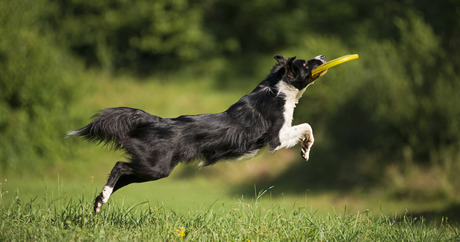 Hold off on doing lots of sustained running and jumping until your dog is full-grown. Get your vet’s okay before doing anything strenuous with a dog who’s older, out of shape, or comes from a breed prone to physical problems, such as hip dysplasia.